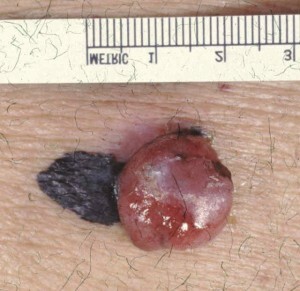 Melanoma is a very common malignancy. It’s incidence is rising rapidly. Close follow-up essential for melanoma patients. Best prognosis for tumors less than 0.76mm. May is national Melanoma awareness month with several upcoming public awareness and educational programs about this deadly disease. melanomas and very atypical presentations of this malignancy. The Skin Center will be focusing on Melanoma with our program of comprehensive skin cancer screenings and education starting this month and ongoing though year. If you or your family have concerning lesions, a history of sun burns, fair skin, more than 10-20 atypical moles, or a family history of skin cancer, you or your family member need at least an annual full body skin exam. This is a very treatable disease when caught in its earliest stages. 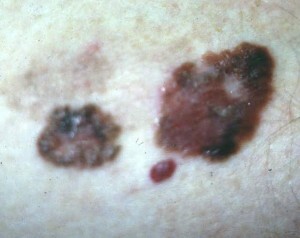 Most melanomas are found by patients on self- skin exams. Prompt biopsy is key for any suspect new or changing lesions. The American Academy of Dermatology recommends annual full body skin examinations. Adult patients are reminded to have their ANNUAL FULL BODY SKIN CANCER SCAN/ SCREENING. Routine cancer screenings are important for prior skin cancer patients as well as patients with other forms of malignancies. Any new, changing, or suspicious mole should be surgically removed and sent for dermatopathologic exam. When in doubt, it is always best to biopsy a lesion. May marked national Melanoma awareness month with many educational programs about this disease. We are all familiar with Southern California’s abundance of sun and outdoor activities, and its reputation as a hot bed for all types of skin cancers, including malignant melanoma. The lifetime risk of melanoma is growing higher and is now approximately 1/55 individuals. We are seeing more and more melanomas and very atypical presentations of this malignancy. We would like to thank you and express our heartfelt appreciation for being a part of our extended family. We understand that you have a choice in healthcare, and we appreciate you choosing us as a part of your trusted family of health care providers. As part of our continued commitment to patient care and service, we are writing you with our annual Melanoma update. We would like to remind you about the importance of proper follow up and care and thank you for your time and dedication to your continued good health. If you notice any new, changing, growing, itchy moles, or bleeding spots, you should come in right away for a skin check. It is also very important that your family members are continually well educated about atypical moles and melanoma. Currently, full body screenings of close family members by a dermatologist are advised. Remember that early detection of melanoma may be life saving. Most thin melanomas which are detected really early do not spread. The risk of developing a second melanoma is approximately 2-8% in patients with a prior diagnosis of melanoma. As always, we look forward to seeing you and would be happy to assist you in any way we can. We wish you the best in your continuing care. If you have any other questions or need to schedule your appointment, please call us at 949-582-SKIN. We would like to review some new recommendations from the Scripps Annual Melanoma Conference in San Diego. As always, we’d like to remind you about the importance of proper follow up and care and express our appreciation of your time dedicated to your good health. If you notice any new, changing, growing, itchy moles, or bleeding spots, you should come in right away for a skin examination. It is also very important that your family members are well educated about atypical moles and melanoma. Currently, full body screenings of close family members by a dermatologist are advised. Remember that early detection of melanoma may be life saving. The risk of melanoma recurrence is higher within 5-8 years after the initial diagnosis. It is important to continue regular follow ups, especially during the first 7-8 years. The major form of melanoma recurrence presents as a lump or bump under the skin, or irregular brown color at the site of the melanoma or close by. 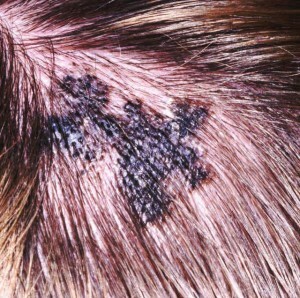 Melanoma may metastasize (spread) to lung, liver, brain, etc. Most thin melanomas which are detected really early do not spread. The risk of developing a second melanoma is approximately 2-8% in patients with a prior diagnosis of melanoma. Good routine dermatology check-ups are very important. 4. American Academy of Dermatology at www.aad.org. As always, we will be happy to assist you in any way we can. We wish you the best in your continuing care. We understand that you have a choice in health care and we thank you for choosing us to serve you and your family’s dermatology needs. If you have any other questions or need to schedule an appointment, please call our office 949-582-SKIN. We recommend in-office visits with us at least every 3-4 months for the first year after the new diagnosis of Melanoma has been made, and then about every 6 months thereafter continuously. For best care, we often recommend alternating your visits between our office and the UCI Melanoma Center. As you may recall, we traditionally have recommended that every melanoma patient establish baseline care with the UCI Melanoma Center in Orange. Drs. Linden and Jakowatz are excellent and come highly recommended. They have added expertise and are most up to date with respect to the latest advances and improvements in Melanoma. Please call them at (714) 456-8171 or (714) 456-6011. Additionally, Dr. Jakowatz has expertise in a new state-of-the-art mole imaging system called SIA scan, available at UCI. If you notice any new, changing, growing, or bleeding spots, you should come in right away for a skin examination. It is also very important that your family members are well educated about atypical moles and melanoma. Currently full body screening of close family members by a dermatologist are advised. Remember that early detection of melanoma may be life saving. Can my birthmark become a Melanoma? Melanoma is the number 2 cause of cancer death (after breast cancer) in women between ages 30-35 years old. Presently approximately 1 in 60 people will develop melanoma. By the year 2010, it is estimated 1 in 50 people will develop Melanoma. Causes of most Melanomas are unknown. Sunlight plays a role in development of some Melanomas, but a direct role in less than half of all melanomas. Defects and dysregulation in genes play an important role in melanoma, as in all cancers. Since we don’t understand the pathogenesis of Melanoma, we can only practice sun prevention as our primary prevention at this time. Most Melanoma can be cured surgically if detected early. The prognosis and cure rates are excellent if removed when in situ. Apply sunscreen with sun protection factor (SPF) 15 or higher, both UVA and UVB protection. The cure rate is EXCELLENT if the melanoma is found early. Five-Year Survival for all melanomas thinner than 0.85mm 99%! Its incidence is rising rapidly. Sunscreen of at least SPF15 should be used everyday. If you plan to be outdoors for longer periods, then SPF30 is best. All patients with a melanoma should be seen by their dermatologist every three months for the first year. Then they are seen every six months for the next three years. Thereafter, at least once a year full body skin exams are mandatory for best care.